We are a master factory distributor of winches and parts for the manufacturers – Braden, Carco, Gearmatic, DP, Pull Master, Tulsa, Gear Products, Warn, Ramsey, Superwinch, Rotzler, Dinamic Oil, Brevini. (Garwood and Holmes parts available.) Also carry Ingersoll-Rand, Crosby, Columbus McKinnon and Enerpac. If it’s winches, you can find it at Winers. 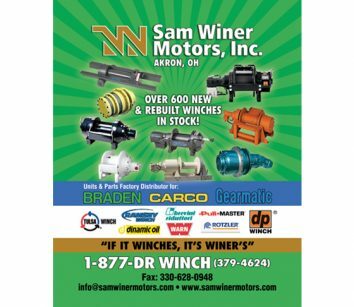 Call 330-628-4881 or visit www.samwinermotors.com.